Chest wrinkles commonly develop due to the effects of time, gravity, and sun exposure, which makes preventing chest wrinkles particularly challenging. The thin, delicate skin on the chest is susceptible to wrinkling because it loses moisture, collagen, and elastin more quickly than in areas of the body where the skin is thicker. The chest area (décolletage) is also exposed to the sun more often than other areas, which can increase the risk of developing wrinkles and loose, sagging skin. 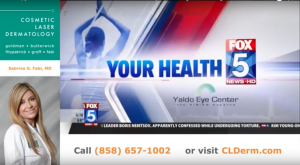 The board-certified dermatologists at San Diego’s Cosmetic Laser Dermatology are known for their innovative skin rejuvenation solutions, including a unique method of chest wrinkle and breast rejuvenation: a chest combination treatment that reduces the appearance of wrinkly skin and improves minor breast ptosis. 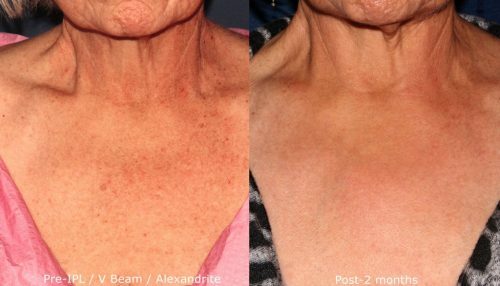 With a precisely administered combination of Sculptra, Radiesse, and Ultherapy, patients can experience both skin and breast rejuvenation at our San Diego dermatology facility. The loss of collagen and elastin in the chest skin over time can lead to a loss of luster, structure, and smoothness. As a consequence, people often change how they dress or even how they feel about their appearance. 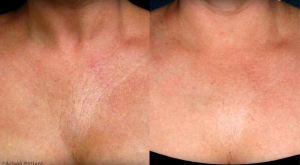 Luckily, the skincare specialists at Cosmetic Laser Dermatology in San Diego offer a variety of services to rejuvenate the appearance of the chest. Calcium-based Radiesse replaces lost dermal volume and triggers collagen production to revitalize the skin. The injectable procedure normally takes a few minutes, yet the effects are immediate and gradually improve over time, lasting up to 2 years. 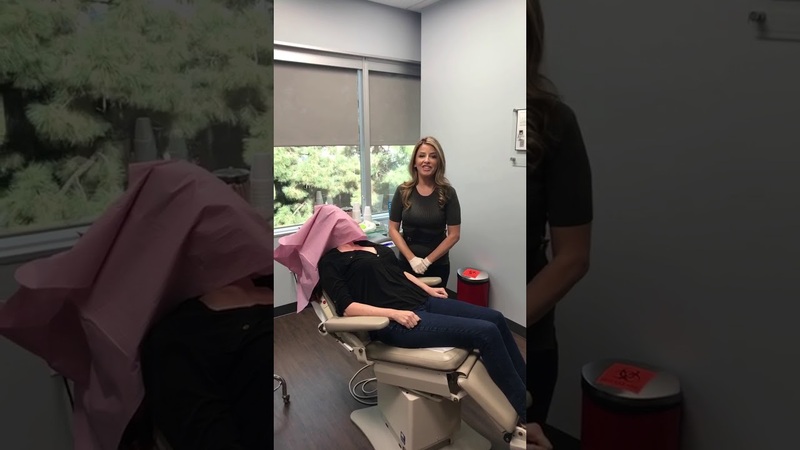 The use of ultra fine needles also means little to no downtime, and the potential side effects are minor, including temporary swelling, redness, and/or numbness around the treatment site(s). Made from poly-L-lactic acid, Sculptra is effective at replacing lost collagen in the skin. After 2-3 treatments over the course of 3-6 months, the skin’s support structure is reinforced for softer, more natural-looking fullness. The possible side effects include temporary swelling and/or bruising, but the results look natural and often last more than two years. Many people have the misconception that breast rejuvenation involves invasive surgery with incisions, scars, and painful recovery. While it’s true that surgery is a viable choice for dramatic breast rejuvenation or enhancement, not all women need or want to take such drastic measures. For minor breast ptosis due to the lax skin, a combination of Radiesse and/or Sculptra and Ultherapy can improve breast lift and perkiness. Non-invasive Ultherapy has properties that tighten skin and build collagen, which complement Radiesse very well. Ultherapy is a non-surgical breast rejuvenation technique that improves the size, shape, and perkiness of the breasts. Ultherapy helps reinforce the breast rejuvenation properties of Radiesse by using micro-focused ultrasound to tighten and lift lax skin. The deep non-invasive stimulation of collagen allows the body’s natural healing properties to tighten and firm the skin. By strengthening the skin’s structural support, skin rejuvenation results in subtly improved breast ptosis and appearance. 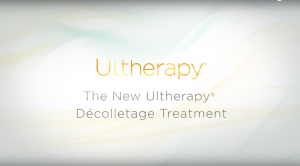 A combination Ultherapy/Radiesse/Sculptra treatment involves virtually no downtime and side effects such as temporary redness, itching, and/or swelling are minimized so there should be a little interruption for patients with busy schedules. The effects of this combination look natural as the tightness and lift continue to improve for the next several months, generally lasting for almost 2 years. Intense pulsed light is a great alternative to Ultherapy with Sculptra/Radiesse for certain candidates. The addition of an intense pulsed light treatment performed 2-3 times over 3 months will not only rejuvenate the skin surface by virtually eliminating brown marks and red blood vessels. The treatment also further enhances wrinkle reduction. This treatment is usually performed at the same time as Radiesse/Sculptra/Ulthera. The only downtime is the flaking off of the sun-damaged skin. Drs. Goldman and Wu in San Diego have published papers on this technique. Q: Who can benefit from a chest rejuvenation treatment? 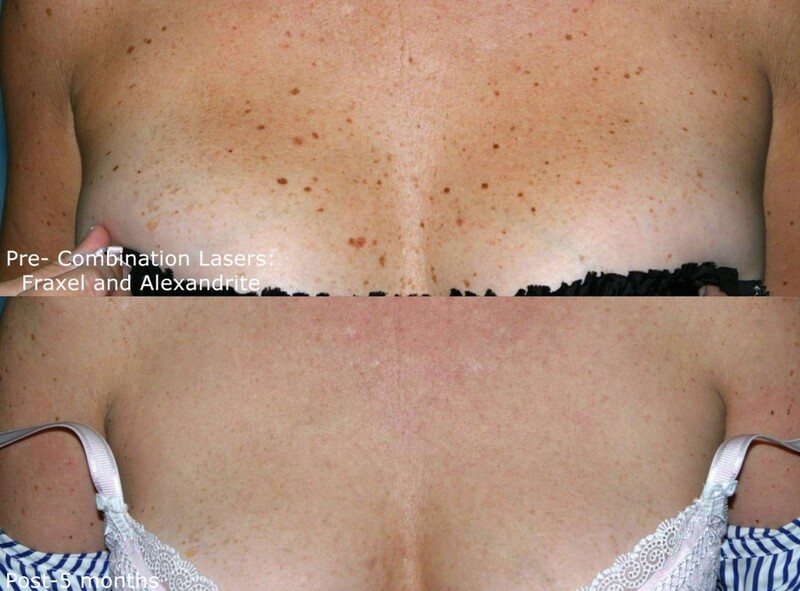 A: A combination chest wrinkle treatment and breast rejuvenation therapy consisting of Radiesse, Sculptra, and Ultherapy is innovative, unique, safe, and effective. However, it does not replace breast implants and it is not intended for small-breasted women who want to transform their figures or for individuals with moderate to severe breast ptosis. For women with minor breast ptosis due to skin laxity or for women satisfied with their breast size but not the slight loss of perkiness, this chest combination treatment may be what is needed to again be comfortable wearing swimsuits or low-cut halter tops and blouses. Q: What are the stages of breast ptosis? A: Breast ptosis occurs in various stages. When most of the tissue below the areolas is still visible and the areolas themselves are level with the breast crease, this is considered mild ptosis. A breast rejuvenation therapy (or a combination therapy that also addresses chest wrinkles) can effectively treat mild ptosis. Cases of moderate to significant breast ptosis are based on areola position vis-à-vis the breast crease and the amount of breast tissue still visible under the areolas.